One of the giant breeds, the Leonberger is powerful and elegant. Females stand 26 to 28 inches at the withers and weigh more than 100 pounds. Males are usually considerably larger, standing 28-31 inches and weighing as much as 150 pounds (although most are in the 120-pound range). Their luxurious double coat is lion-colored, ranging from light sand to a rich mahogany, accented by a black mask and often black tips on the body fur. Their noble, impressive appearance is complemented by dark, almond-shaped eyes characterized by an open, gentle, friendly expression. They are enthusiastic participants in most family endeavors and are adept at hiking, backpacking, running, swimming, and socializing at family gatherings. And they work as enthusiastically as they play. Throughout the world, Leos have demonstrated success in such activities as water rescue, tracking, agility, carting, therapy, and other tasks involving great strength and agility coupled with gentleness. Leonbergers have been compared to those other famous German imports, the BMW and the Mercedes-Benz. They all come from Schwabia and they are all dependable, classy, stable, agile, elegant, and powerful! Noble, powerful, and gentle are the best descriptors of the Leonberger breed. Ideal Leos resemble one’s childhood image of Nana in Peter Pan: big, soft, warm, protective companions, perfect for nestling into or clutching if you are a toddler. Leos are sometimes affectionately referred to as “lean-on-bergers” because of their tendency to lean against their loved ones. A typical and impressive sight at all-breed dog shows is a large “pride” of Leonbergers peacefully and contentedly sitting and lying together in close quarters. However, on closer observation one will find that males and females in the midst of “hormone storms” are carefully separated and have been placed at opposite ends of the group. Leonbergers are excellent watchdogs, not given to frivolous barking or unnecessary alarms. Their imposing size and deep bark are usually enough to deter uninvited guests. They come from watchdog stock, and therefore, instinctively establish and valiantly maintain their household’s territorial rights. However, upon receiving the OK from family members, strangers are accepted and welcomed. To become excellent family and watchdogs, Leonbergers must be well socialized as young puppies and extremely well-trained and under the control of their people at all times. It is difficult to train a dog that has been improperly socialized. The fear of parvo has led some owners to make the tragic mistake of keeping their puppies isolated until they have completed their vaccination series; they risk ending up with a fearful, timid dog that may become aggressive as an adult. Owners must strike a balance: Puppies, especially from birth through four months, MUST be exposed to a variety of people and experiences. There are many parvo-safe activities and places to take dogs, and new owners have to take the time to expose their new pups to as many of these as possible. This is especially true for one’s second and third Leo; it is too easy to keep the new pup in the company of the older dogs, depriving him of the opportunity to develop self-confidence. Leos are large dogs and are frightening to many people simply by virtue of their size. Fear and aggression in a stranger can often activate a dog’s protective instincts. Huge dogs can also do a great deal of damage just by jumping up on someone in a burst of enthusiasm. When you invite a Leonberger to share your life, you bring to that contract the responsibility to make sure that both you and your dog receive excellent obedience training. Leos are devoted family members, especially fond of children and well able to tolerate other household animals. They remain stable and calm amid noise and chaos and will participate joyfully in almost any family venture, from boring shopping trips to stimulating hikes in the woods or swims at the beach. It is vital that these very sociable dogs be an integral part of family life, as they suffer more than most breeds if kept from family-“pack” activities. Leos are subject to the short life span and various health problems that plague most giant breeds. However, Leos tend to be healthier overall than the other giant breeds. This is true because Leo breeders in all countries have been health conscious. Stringent breeding regulations are adhered to on a voluntary basis in every country where the FCI issues papers. Dogs in Germany are registered with the FCI through the German Kennel Club, which has designated the National Breed club to keep the stud book and supervise registrations. Therefore, breeding is closely supervised, and breeders must adhere to the Deutsche Club für Leonberger Hunde breeding regulations for a puppy to be registered. In America, because the Leonberger Club of America maintains the stud book and issues all legitimate registrations, no American-born dog can be registered with the LCA unless the very strict breeding regulations have been followed for both the sire and the dam of the litter. These regulations are far more stringent than those required by breed clubs whose parent organization is the AKC. The American breeding regulations can be found in their entirety on the LeoWorld Web site or obtained by writing the LCA. Also, more details about Leonberger health can be found in the health section of this FAQ. Leos are not natural obedience and agility zealots; however, they are so loyal and conforming to their family’s culture and expectations that they tend to participate in obedience exercises in order to please. Because they are so calm and stable, they perform well even when their handlers are stressed. They usually excel in commands like Down, Stay! Achieving a perfectly executed Sit and Finish is another story. Leos are known in obedience classes for their casual approach to sitting. The sitting part is not a problem, but sitting up straight is not a priority for a dog that prefers to be laid back and relaxed. Retrieving is also not a favorite activity. Chasing a ball, a toy, or a stick is great fun, but bringing it back is such a bother! There are Leos with obedience and agility titles, but these don’t come as easily as they do for smaller dogs. Their long, thick coat misleads some into believing that they require a lot of care. They actually require less care than most dogs. Except for semi-annual “molts,” they only shed moderately. Their coats are waterproof and very wear resistant. Daily brushing is necessary to keep their coats shining and elegant , as well as to keep clothes and furniture in acceptable condition. It’s worth noting that grooming, beyond brushing, toenail clipping, and a little trimming to even the fur on toe tips, is not allowed for the conformation ring in Europe. The natural look of a real working dog that does real work is the sought-after ideal. Be very sure that the breeder is a member of their country’s Leonberger Club and is on the current list of approved breeders. That is your only assurance that the strict breeding standards imposed by most countries have been followed. The FCI does not require any more than the AKC in the way of breeding standards, but most of the national clubs are diligent in requiring adherence to very precise guidelines developed to minimize genetic flaws and diseases. If the price quoted for a Leo is out of line, either much lower or higher than the typical price for your country, that is a cue to be careful and visit several breeders. Leos are expensive (in the $1,000 range, regardless of country), but Leonberger breeders have been diligent about not letting prices get driven up to the level that greed interferes with good breeding practices. The current prices allow most breeders to recoup the costs of breeding healthy litters and also help keep frivolous buyers from purchasing dogs. No! Leos were bred with an eye toward eliminating drooling. They will occasionally drool when stressed or after drinking (usually with their heads and front paws as far as possible in the water!). Because Leos are carefully bred only after the age of 2 years and with a minimum of a year between litters for each female, they are limited in number and may be difficult to acquire. The typical Leonberger breeder is highly selective when choosing homes for the puppies. The best approach is to subscribe to a national Leonberger club newsletter and begin corresponding or conversing with breeders in your area. A good method is to get on a waiting list for a puppy bred by a breeder whose dogs you like. Leos can be shown in a wide variety of events in fun matches, rare breed shows and, of course, all FCI-sponsored events. Besides conformation and obedience, Leos participate and enjoy tracking, pulling, agility, and especially therapy work. All of the clubs listed in the Kennel Club Recognition section below, sponsor regional, national and international events for Leonbergers. The early history of the Leonberger is clouded and tumultuous, revolving around the enthusiasms and exploits of Heinrich Essig (1809-1889). Essig was a successful politician with a genius for marketing and public relations. He was an alderman and a prominent citizen in Leonberg, a town on the outskirts of Stuttgart in southern Germany. (Leonberg is just 50 kilometers from Rottweil, another famous town that gave its name to the dog breed that originated there.) Essig was a successful professional animal trader who surrounded himself with a variety of rare and exotic animals. In dogs, he preferred large and imposing breeds, which he bred, bought and sold internationally. In our time, we would probably consider him an irresponsible puppy-mill owner. He bought and sold dogs for a span of fifty years, trading sometimes 200 to 300 dogs a year at the height of his career. Like other entrepreneurial individuals, Essig’s strong suit was vision and marketing communications, not attention to detail! So, unfortunately, he kept no detailed logs or records of his breedings, nor did he believe it necessary to write a standard for the breed he created. What we know of the development of the Leonberger comes from word-of-mouth reports, copies of advertisements written by Essig and others, references in a handful of nineteenth and turn-of-the-century dog breed encyclopedias, and some very lively articles and correspondence found in nineteenth-century animal periodicals like Hunde-sport und Jagt, Der Hundefreund, and Der Hund, a German nationwide dog magazine still being published today. Given Essig’s personality and political position, it is likely, but not clearly documented, that he deliberately combined his desire to promote his town with his desire to promote his business. Our best records indicate that in 1846 he declared the “creation” of the Leonberger as a legitimate breed of dog. The town crest of Leonberg contains a lion rearing up on its hindquarters. Although it is not known for sure if the town name refers to a lion, there is a definite association through the crest. The Leonberger, as we know it today, is lion-like in appearance. However, Essig’s early versions certainly weren’t. According to Essig, he crossbred a black-and-white female Landseer with a long-haired Saint Bernard that he had acquired from the Saint Bernard monastery in Switzerland. The puppies were, of course, black and white. He reportedly then crossbred these dogs for four generations, outcrossing with a yellow-and-white Saint Bernard and later a white Pyrenean Mountain Dog that he had in his kennels. He was striving at this early stage for an all-white dog because they were very fashionable at the time. It was only many generations and outcrossing later that the golden color and black mask became typical. Early records indicate that in 1865, Essig showed a dog at the Octoberfest in Munich that was described as a fine dog, resembling a lion, yellow and brown, with black tips. It is important to note here that the Leonberger we know today could not have come from the matings that Essig initially described. As has been pointed out by Letellier and Luquet in France and Nijboer in Holland, the AY allele does not exist in the three breeds that were supposed to be the originating breeds. 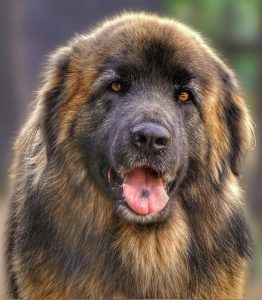 Also, from a genetic standpoint, the Leonberger head is morphologically much different from that of Saint Bernard or Newfoundland. More likely, the offspring of the original crossings were bred to local dogs that had relatively fixed genetic characteristics but were not identified as a breed. Very large dogs with appropriate coloration and with heads shaped similarly to the Leonberger, as we know it, were known in the region and are described in 17th- and 18th-century literature. Also, intriguing documentation suggests that dogs from Leonberg were used at the Hospice of Saint Bernard in 1830, well before the origination of the Leonberger, to breed with the only Saint Bernard to have survived an outbreak of distemper. Whether Essig actually created a new breed by careful selection following genetically sound principles is rather doubtful. What we do know for certain is that Essig’s marketing genius resulted in such widespread popularization of the breed that the Leonberger, as a breed, survived cries of outrage from breeders of Saint Bernards and Newfoundlands, from judges, and from the editors of dog magazines. At the same time that he was being attacked, Essig’s ardent loyalists paid great sums for his dogs and defended him publicly. Through Essig’s marketing skill, his dogs found their way into the castles of royalty, such as the Empress Elizabeth of Austria, the Prince of Wales, Emperor Napoleon II, Garibaldi, the King of Belgium, Bismarck, King Umberto of Italy, and the Czar of Russia. They were exported as far away as the United States, England, Newfoundland, and Japan to the wealthy who desired large fashionable dogs. Essig died in 1889 without ever having defined a standard for the breed or a defensible description of his breeding program. It is a tribute to the qualities of the Leonberger that in spite of these obvious deficiencies, and in the face of ever harsher critics, there were enough enthusiastic owners to form, beginning in 1891, the first Leonberger clubs. The first significant club was the International Leonberger Club founded in 1895 in Stuttgart. The Club President, Albert Kull, was an artist with an eye for detail. He wrote the first standard for the Leonberger; it formed the foundation for all subsequent standards. 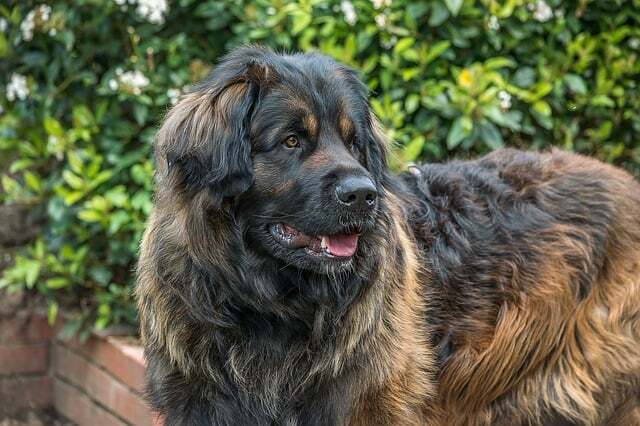 Kull’s work did much to reestablish the credibility of the breed, and the Leonberger began to flourish with three more serious clubs being founded. World War I almost rendered the breed extinct. If it were not for the determination and dedication of two men, Herr Stadelmann and Herr Otto Josenhans, the breed would surely have become a mere footnote in the history of German dogs. After the War, Stadelmann and Josenhans scoured Germany searching for Leonbergers. They found 25. Of these, five were suitable for breeding. Because of inflation and food shortages, it was unlikely that individuals could have personally and individually supported breeding programs, so a group of seven people joined together in 1922 to form the Leonberger Hunde Club in Leonberg and a breeding cooperative known as the Leonberger Hundezucht Genossenschaft. The organized breeding program of the Genossenschaft brought about a revival of the breed brought honor to the town, and provided foundation stock to establish several kennels. Most notably, these men established the official Breed Registry, which continues uninterrupted today. Stadelmann’s work progressed until the early 1930s when the authoritarian control of the Third Reich began to influence the dog world. A Reich-governed club, the Fachschaft für Leonberger, was established in Sandhausen when the Reich assumed control of all breed registries. Surprisingly, breeding, although very reduced, continued throughout the war. Both dogs and accurate records survived the destruction. In 1945, 22 puppies were registered and in 1946, 17. At the end of the war it again took a group of devoted enthusiasts to reestablish an organized breeding program. Two rival clubs were established in 1946 and 1947. The club founded by Albert Kienzle, Hans Weigelschmidt, and Otto Lehmann became in 1948 the present-day Deutsche Club für Leonberger Hunde. In the early ’50s, the Breeding Committee Chairman, Werner Lutz, and the third president of the DCLH, Robert Beutelspacher, wrote the modern-day standard and breeding regulations, which had a profound impact on the development of the Leonberger as we know it today. In 1975, the German Club brought all the Leonberger breed clubs from the major European nations together and founded the International Union of Leonberger Clubs. Now, clubs from 17 nations correspond frequently and meet annually work to insure the greatest possible uniformity and homogeneity of the breed throughout the world. Due to his original use, the Leonberger is a strong, muscular, yet elegant dog. He is distinguished by his balanced body type and confident calmness, yet lively temperament. Males, in particular, are powerful and strong. As a family dog, the Leonberger is an agreeable partner for present-day dwelling and living conditions, who can be taken anywhere without difficulty and is distinguished by his marked friendliness toward children. On the whole deeper than long and elongated rather than stocky. The proportion of muzzle to skull region is about 1 to 1. Skin close-fitting all over, no wrinkles. Skull: In profile and seen from the front, slightly arched. In balance with body and limbs, it is strong but not heavy. The black part of the skull is not substantially broader than near the eyes. Stop: Clearly recognizable but moderately defined. Jaws/Teeth: Strong jaws with perfect, regular and complete scissor bite, in which the upper teeth close over the lower without any gap and the teeth are placed vertically in the jaw, with 42 healthy teeth, according to usual tooth formula (missing M3 tolerated). Pincer bite is tolerated; no constriction of canines in the lower jaw. Chest: Broad, deep, reaching at least to the height of elbows. Not too barrel-shaped, more oval. Very well furnished; while standing, it hangs down straight; also in movement, it is only slightly curved and preferably should not be carried above the prolongation of the top line. Very strong, especially in males. Pastern: Strong, firm; straight, seen from the front. Almost vertical seen from the side. Legs: Position when seen from the rear, not too close, parallel. Upper thigh: Rather long, slanting, well muscled. Upper and lower thigh form a distinct angle. Ground-covering, even movement in all gaits. Extending well in front, and good drive from hindquarters. Seen from front and behind, limbs move in a straight line when walking or trotting. Hair: Medium soft to coarse, profusely long, close-fitting, never with a parting, letting the form of the whole body be seen despite the thick undercoat. Straight, slight wave still permitted; forming a mane on neck and chest, especially in males; distinct feathering on front legs and ample breeches on hind legs. Colour: Lion yellow, red, reddish brown, also sandy (fawn color, cream color) and all combinations in between, always with a black mask. Black hair tips are permitted; black must however not determine the dog’s basic color. Lightening up of the basic color on the underside of the tail, the mane, feathering on front legs and breeches on hind legs must not be so pronounced as to interfere with the harmony of the main color. A small white patch or stripe on chest and white hair on toes will be tolerated. Any departure from the foregoing points should be considered a fault and the seriousness with which the fault should be regarded should be in exact proportion to its degree and consider how much the essentials (in particular temperament, type, balance and movement) are affected. Severe anatomical fault, i.e. pronounced cow hocks, pronounced roach back, very hollow back, extreme turning out of front feet. Totally insufficient angulation of shoulder, elbow, stifle or hock. Absence of teeth (with the exception of M3). Over- or undershot or other faults in the mouth. Distinct ring tail or tail forming too high a ring. Faulty colors: Brown with brown nose and brown pads; black and tan; silver; wild-coat color. Brown nose leather, brown pads. Very strong lack of pigment in lips. Eyes without any brown. Too much white (reaching from toes to pastern, white on chest larger than palm of hand, white in other places). The worldwide federation of national dog clubs with membership including 19 European countries, 12 Latin American, 2 Asian and 1 from Africa. An additional 11 countries are affiliated as associate members. All national Leonberger Clubs are affiliated or associated with the FCI. The LCA is loosely associated through its Member Status in the International Union of Leonberger Clubs e.V. with headquarters in Germany. The Leonberger Club of America maintains its own registry and is not, nor does it wish to be, affiliated with the AKC. AKC affiliation would eliminate mandatory adherence to the LCA’s stringent breeding regulations. See addresses and contacts below. The very strict breeding guidelines and the diligent oversight of the national Leonberger Clubs have been successful to date in preserving the general health of the breed. However, there are special medical problems, most of which are associated with giant breeds in general, that every breeder, owner, and potential owner should be aware of. Hip and elbow dysplasia are unfortunately found in most large breeds. The Breeding Committees of the various national Leonberger clubs have been extremely diligent in education and enforcement of breeding regulations designed to minimize dysplasia in Leos. The OFA is now reporting fewer than 11% of our dogs with dysplasia. Leonbergers are not allowed to be bred without OFA certification and, in most countries, without proof of HD-free ancestors for at least three generations. Penn Hip ratings are currently being seriously considered in the United States as an additional breeding requirement. “Pano” is a disease with no known cause that resolves without, or in spite of, treatment! It is a generalized inflammation of the bones that is commonly referred to as growing pains. A healthy puppy suddenly develops an acute and painful lameness with no known history of trauma. The lameness often shifts from one limb to another. The good news is that pano is self-limiting and does not seem to result in any long-term damage. Addison’s disease is a rare hormonal disorder of the adrenal glands. It has been diagnosed in both European and American Leonbergers. It is serious and can lead to death if undiagnosed. However, if diagnosed correctly, it can be very successfully managed with medication. Affected dogs often have periodic vomiting and diarrhea, lethargy, exercise intolerance, and weight loss. It can be definitively diagnosed with blood tests. The bloodlines that have shown evidence of Addison’s disease are being carefully monitored in the United States by the LCA’s Heath Committee. Leonbergers are known to carry the genes for ectropionism and entropionism (inverted eyelids). These can be corrected with a relatively minor surgical procedure. This condition is considered a major fault, however, and dogs known to carry the gene are not allowed to breed. Bone cancer is a frequent cause of death in giant breeds, and Leonbergers are no exception. However, it usually does not strike until dogs have passed their seventh year and frequently much later.